Saturday 27th April - Saturday 25th May 2019 . When you register for an Alexandra Palace course you will receive a course entry card and a record of achievement booklet on your first lesson. 1. Please bring your coloured course membership card with you to EVERY lesson to show that you are on a course. Please keep this safe as we cannot replace it if you lose it. If you do misplace it you will need to report early to reception so we can check you off the register, which does take longer. 2. Please arrive 15 minutes before your lesson starts as it is very important to be on time for your lesson. 3. On your first lesson of a new course please bring your achievement booklet with you or collect one at reception if you are new to our courses. Please ensure your name is printed on the front. If you do not have an achievement booklet and you have already passed levels we may have to re-assess you and this must be done before the class starts. A replacement achievement card costs £1. You also need to bring your record of achievement booklet with you to your last lesson as you will have an assessment and test. 1. Skates are included in the course. Skates should fit snugly, not slip up and down when you walk. 2. Please lace skates firmly though not too tight and use all the hooks. Skates usually feel uncomfortable if you are not used to them. 3. Blades should be sharp to the touch, if in doubt ask the skate hire staff. 4. Clothing should be warm, preferably layers. Gloves are a good idea but no hats or scarves please. 1. We take 15 skaters to 1 coach. If classes exceed this which is not often, we add an assistant to compensate. 2. 5 minutes before your class starts please wait off the ice at the first entrance on the right hand side of the rink as you come in. 3. If the skater is reluctant to go on the ice please do not force them on, let them sit and watch a while. They may want to join in a little later. 4. When the classes are taking place could parents/guardians please sit in the stands or café and not stand near the barrier. If you have any questions or queries please direct them to the course co-ordinator who will be available at the beginning or end of each class. 5. Photography or filming in not permitted during lessons. 1. Levels beginner-4 have their lesson from 1100-1130, levels 5-10 are 1030-1100, and bronze, silver and gold are from 0930-1015. 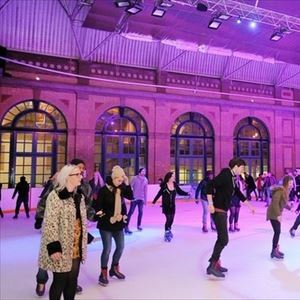 Saturday course users can skate on the Saturday public session from 1130-1330. Parents/guardians may watch for free but must pay if they wish to skate. You may pay early by showing the course card. 2. You will be able to book for next term once you have had your test at the end of the current course. You will need to have your record of achievement booklet to hand. Due to a high volume of course users we strongly recommend booking your next course as soon as possible, on the day bookings cannot be guaranteed. 3. Courses are non-refundable of transferable. Unfortunately we cannot compensate for any lessons missed unless it is the fault of the Ice Rink. 4. If course numbers are not sufficient Alexandra Palace reserve the right to cancel courses, or skating levels may be amalgamated at any time.